Rosling writes about the most important things in the world and does so in an accessible and entertaining style. He busts myths using facts. This is what non-fiction is supposed to be. Much of what "everybody knows" and that we read in the news every day is wrong, because hardly anyone bothers to do reality-checking. This is a recurring problem in non-fiction books, including ones about science. So, when finally someone is exposing ignorance, clarifying truth, and exploring logical implications, Rosling writes about the most important things in the world and does so in an accessible and entertaining style. He busts myths using facts. This is what non-fiction is supposed to be. Much of what "everybody knows" and that we read in the news every day is wrong, because hardly anyone bothers to do reality-checking. This is a recurring problem in non-fiction books, including ones about science. So, when finally someone is exposing ignorance, clarifying truth, and exploring logical implications, I am going to give him 5 stars. “Factfulness’ is about you being convinced to view through rose-colored lenses each metaphorical cup of water provided by NGO/government/charity is half-full! The respectably-sourced graphs and charts included show the economic, health, and wealth status of the people of earth are ever climbing higher and higher statistically, so the author concludes it is logical to project that the wealth, education, and health of even the lowliest, most impoverished, most despised and ignorant classes of peop “Factfulness’ is about you being convinced to view through rose-colored lenses each metaphorical cup of water provided by NGO/government/charity is half-full! The respectably-sourced graphs and charts included show the economic, health, and wealth status of the people of earth are ever climbing higher and higher statistically, so the author concludes it is logical to project that the wealth, education, and health of even the lowliest, most impoverished, most despised and ignorant classes of people will be in the future equal to that of Bill Gates some day! Hallelujah! Smart mansions will be in all of our futures! Each of us will be smart and educated as Ph.D. graduates of a college with the stature of Yale or Harvard or MIT! There will be unlimited electricity, pure water on tap, elaborate heating and air filtering and and robotic devices to make all of us as comfortable as rich men are today! All of us will have walk-in closets the size of ballrooms, filled to the brim with hundreds of dresses and suits and shoes each costing $50,000 (current dollars) a piece because of the couture sewing and materials! We all will be able to possess gorgeous works of art, and the most rarest of food delicacies with exotic ingredients, with music in the background provided by musicians of spectacular skill! All of us can fly and visit foreign countries on private jets, experiencing exotic cultures, foods and sights with beautiful healthy companions serviced by the best plastic surgeons and doctors giving the best preventive dental and healthcare! Oh, wait. Snap! These graphs are about what percentage of people sleep under a roof even if it is only tin or plastic, or eat at least once a day, or whether they earn at least enough money for a couple of buckets of water, and some electrical power a day or a visit from a traveling nurse once in awhile. Some school at least was available for most kids for up to nine years, whether books and pencils and computers were there or not. People do not really need to know more than basic reading and writing, right? That all counts as a higher quality of lifestyle, if surviving on the minimums required for happiness and health are met, right? Besides ignorance is bliss! It has been proven over and over people are happy with just the basics of life. The elites are successfully eliminating poverty, misery, and ignorance! These poor folks (by Western standards, but not by local standards) have twenty-four hour reliable electricity to look forward to someday, right? even if not now. Some day all third-world middle-class folk (by local third-world standards) will always have clean water on tap, garbage pickup and recycling, consistently supplied twenty-four hour power for refrigerated foods and medical serums, and top world-quality health care like all of the upper classes all over the world. I answered the author's questions in the beginning of the book about factual world knowledge all correctly, so I guess I understand and have retained what I have learned from studying past UN surveys correctly similar to the author, and perhaps more knowledgeably than most. However, confidence about the future of Mankind seems much more uncertain to me than what the authors or elites believe. Elites and many in the more privileged middle-classes, at least based on this book, think underplaying suffering and lack of resources is a good thing! It is a Good if you have electricity four hours or less a day! It is a Good if you were allowed to go to school for nine years! It is fantastic if you have something to eat at least once a day or someplace to call home, even if it doesn’t have a legal title or plumbing! Who cares if you prefer medical care based on home remedies and witchcraft because of your 9th-grade education and lack of money for extras like a real hospital with working MRI’s or antibiotics or medicines? Or that the roads are full of holes, if they exist at all, the air is unbreathable, dead animals lie in gutters everywhere alongside garbage? You are better off than last year, and you are certain to have improvement next year, despite global warming and growing environmental degradation. Statistics don’t lie! Especially projections made on the most positive of guesses, ignoring many other ongoing conditions like the environment and government instability and culture wars. “We’re all gonna die,” whispered the young knight next to me. Twenty seven thoughts raced across my mind. First, knights weren’t as advertised. Did this one really use the word ‘gonna’ instead of ‘going to’? And what about this contraction ‘we’re’? I would’ve been expecting something like, “We shall all perish!” Pfft. Dissapoint. Second, I hadn’t had my breakfast, and I’d always sworn not to die on an empty stomach. Third, I suddenly realized that stars were basically transmutation machines… did “We’re all gonna die,” whispered the young knight next to me. Twenty seven thoughts raced across my mind. First, knights weren’t as advertised. Did this one really use the word ‘gonna’ instead of ‘going to’? And what about this contraction ‘we’re’? I would’ve been expecting something like, “We shall all perish!” Pfft. Dissapoint. Second, I hadn’t had my breakfast, and I’d always sworn not to die on an empty stomach. Third, I suddenly realized that stars were basically transmutation machines… did that mean stars could be considered philosopher stones? The other twenty four thoughts involved a menagerie of cat gifs, black holes, machine learning, and other such miscellanea. But most importantly, one of them involved a plan. “What is your name?” he spoke. And *pooft* off he went over the side of the bridge. Plan: Successful. If there’s any one theme to Factfulness, it’s this: Neither people, nor the world, are simple. So don’t treat them as simple. Instead, learn to see and embrace the complexity in both yourself and the world at large. 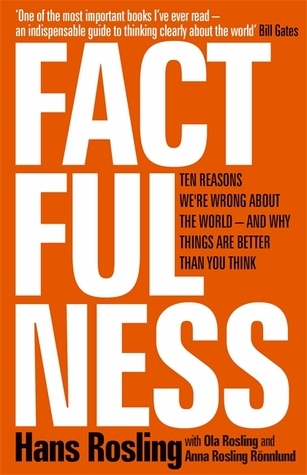 In particular, Factfulness aims to disabuse readers of the simplistic notion peddled by the media (news, film, TV), politicians, and even well-meaning activists that the world is far worse than it is and is getting worse. It isn’t. Point in fact, human civilization – on average – is probably the best it’s ever been. Yes, ever. Chances are high, if you’re reading this, you live in a part of the world experiencing a golden age of peace, technology, and plenty. The Gap Instinct: This is the simplistic instinct to polarize categorization (aka the fallacy of false dichotomy). Good or evil. Rich or poor. Correct or incorrect. In reality, most things fall somewhere in the middle. The Negativity Instinct: This is the simplistic instinct, which was evolutionary useful for survival, to find negative events more dramatic and interesting than positive ones. And thus our news and stories tend to be skewed towards the negative rather than the positive. Good business, maybe, but not an accurate depiction of the state of humanity. The Straight Line Instinct: This is the simplistic instinct, what David Hume once invoked when he discussed his famous Problem of Induction, to assume that past trends continue into the future unchanged. However, this is false. The world is always changing, and majority of trends are best modeled with non-linear curves. The Fear Instinct: This is the simplistic instinct to magnify the dangers of the things we fear and minimize the dangers of the things we do not fear. For example, in the US, terrorism has resulted in 3,662 deaths in the past 36 years – or about 100 deaths per year. On the other hand, traffic accidents result in 40,000 deaths per year, or 400 times the deaths due to terrorism. So why this weird conservative push to ban immigrants from terrorism hotspots? If safety is our goal, wouldn’t it make way more sense to ban immigrants from countries with poor driving records? The Size Instinct: This is the simplistic instinct to think we understand numbers better than we do. In particular, single numbers are far less useful than rates. For example, did you know that India puts out 1.6 BILLION tonnes of Carbon per year? That’s 320 million elephants worth of carbon! Clearly, India is problematic when it comes to climate change. India’s carbon usage PER CAPITA is only 1.2 tonnes. The US carbon usage is fifteen times that, at 16.6 tonnes per capita. So between these two countries, who really should be expected to reduce their emissions? Who shares a greater blame for climate change and needs to lead the wold by setting a better example? [On this note, I would direct anyone serious about doing their part to UN's Climate Neutral Now program. Choose to be the hero, not the villain.]. The Generalization Instinct: This is the simplistic instinct to create excessively large categorizations or draw conclusions from insufficient data. We might well call this the ‘-ism’ instinct, as it’s responsible (with help from confirmation bias) for maintaining racism, sexism, and all the other -isms of the, um, I was gonna say rainbow but somehow that doesn't fit... what's the opposite of a rainbow? A big pile of unicorn turds? Yeah. That'll do. The Destiny Instinct: This is the simplistic instinct to view the world as unchanging, or destined to be the way it is. For example, many Westerners assume Africa is somehow destined to be a war-torn, impoverished continent. Not so. By the middle of the century, Africa will almost certainly house some of the fastest growing economies – and business people would be fools to miss the investment opportunities. Now I like Neil deGrasse Tyson, but he's an astrophysicist and I'm pretty sure child psychology isn't part of the astrophysics curriculum. Maybe he's right, maybe he isn't. But there is absolutely no reason to believe any part of that quote just because he's a celebrity scientist who knows a lot about astronomical phenomena. P.S. He isn't right. The only adults I've ever seen who limit the creativity of children don't do it unwittingly. They do it on purpose, and often for the best of intentions. For example, parents teach their children they cannot leap off a building and fly away like a bird. Generally, this is a good thing to know: human beings don't fly with our bodies, we fly with our minds, as true of adults as it is of children. The Blame Instinct: This is the simplistic instinct to assign blame (or credit) to individual people or initiatives. For example, many US voters vote out (or in) a president on the basis of the health of the economy. In reality, the president has little to no control over it. The systems of our civilization are ultra-complex and interconnected, and they function (or fail to function) because of the deeds of the many, not the few. The Urgency Instinct: This is the simplistic instinct to believe quick action is better than no action. In reality, and to borrow one of my favorite quotes, “The easiest way to do something is properly.” Taking the extra time to do something right is nearly always the best way to do it. And those are the ten instincts, each of which has its own chapter. Obviously, Factfulness goes into far greater detail, and each chapter is further spiced up with interesting charts and graphs, as well as anecdotes from the author’s time as a doctor and a lecturer. Now I'll be the first to admit I'm not a huge fan of non-fiction. Too often, I find it lacks voice, which makes the reading experience rather sterile. Not so here! There’s a distinct feeling of the author speaking to you, personally, and he’s not afraid to reveal his own fears and motives. Because of this, Factfulness manages that fine line between informative and entertaining, making it a light yet thought-provoking read. It’s a problematic question because the definitions of “low” / “middle” / “high” are ambiguous. Are they being defined statistically along a normal curve? That can’t be, because that would make the question pointlessly tautological: the answer would, by definition, be 'middle.' So how are they being defined? The author claims the “correct” answer is B – but relative to basically anyone reading the book, the real correct answer is A. Because how he defines “middle” income, as $2/day to $32/day is AT ITS HIGHEST ($11500 a year) below the poverty line for higher income countries – which is how the vast majority of respondents would define low income. In another example found within the Urgency Instinct chapter, the author makes a rather poignant confession. He admits to panicking and instituting a quarantine that causes a group of accidental deaths, the results of which he witnesses first-hand. He realizes he's to blame and thinks he made the wrong call. In fact, he's engaging in a bit of hindsight bias. Easy enough, looking back after he learns there was no actual need for the quarantine, that he should have chosen otherwise. But in the moment, with the information that was available? He chose to play it safe, and that was probably the best decision. I daresay most readers, unburdened as we are by any sense of guilt, would agree. This muddies the chapter as a whole. It's important to realize that it's true that many bad decisions are made because "leaders" are trying to avoid the appearance of inaction. But it's also important to realize that essentially every decision you ever make will be made with incomplete information and that there truly do exist situations in which doing nothing is the worst thing you can do. Description: Why are people convinced that the world is more frightening than it really is? Hans Rosling thinks he has the answer. Professor Hans Rosling was 'the man in whose hands data sings'. He was dubbed 'a true inspiration' by Bill Gates and became a viral celebrity thanks to his popular TED talks which broke down the statistics behind global health and economics.